To the casual baseball fan Barbaro Garbey was not unlike thousands of other former major leaguers. That is, he came, he played, and -- almost before you’d gotten a chance to get to know him -- he was gone. A 2007 study by a University of Colorado research team pegs the average big-league career at 5.6 years. By that measure, Garbey was decidedly atypical, lasting parts of just three seasons (1984-85 with Detroit and 1988 with Texas) before vanishing into the relative obscurity of the minors and the Mexican League. His story, however, is far from typical. Even to ardent supporters of the Tigers of the mid-1980s Garbey is today nothing more than a footnote in history. Some might remember him as the early-season platoon partner to Dave Bergman at first base, while others might recollect how he and Johnny Grubb were sharing designated-hitter duties by season’s end. Some, with terrific memories, might remember how his second-inning infield single off Kansas City Royals starter Charlie Liebrandt in Game Three of the American League Championship Series helped push across the lone run (scored by Chet Lemon after reaching on a fielder’s choice that forced Garbey at second) that clinched the American League pennant for the Tigers. But mostly Garbey was a complementary player on a team full of larger-than-life personalities with names like Trammell and Whitaker, Parrish and Gibson, and Morris and Petry. To get a truer sense of what Garbey meant to baseball, one needs to travel 90 miles southwest of Key West, Florida, to Havana, Cuba. That is where the Barbaro Garbey story must start and where almost a quarter-century after his disappearance from the major leagues, he was still revered by many. Indeed, it was on a May night in 1980 that Garbey climbed aboard a cramped fishing boat with about 200 other Cuban refugees as part of the Mariel boatlift -- or “freedom flotilla” -- that eventually saw an estimated 125,000 Cubans seek a new life in the United States through an agreement between Cuban President Fidel Castro, the U.S. government, and Cuban-Americans. Garbey’s decision to board that vessel made him the first member of the Cuban national baseball team to leave for the United States since Castro closed the borders to his nation’s athletes in 1961. Barbaro Garbey, the youngest of nine children, was born on December 4, 1956, in Santiago de Cuba to Aristides and Noelia Garbey. It is from his birth date – the feast of St. Barbara on the Catholic Church’s liturgical calendar and a significant celebration in Cuba -- that his name originates. Garbey said many born on December 4 have either the name Barbaro or Barbara. Garbey came by his athletic prowess naturally; two of his siblings were world-class athletes. Older brother Rolando fought as a light-middleweight in the 1967 Pan American Games and won a gold medal in boxing. Rolando won a silver in the 1968 Mexico City Olympics and added a bronze at the 1976 Montreal Games. He coached the Cuban boxers at the 2004 Athens Olympics. Garbey’s sister Marcia placed fourth in the 1972 Munich Olympics as a long jumper. Like many young children the world over, Garbey began playing baseball as a little leaguer in Santiago de Cuba. His family moved to Havana when he was 8 years old and it was only a matter of time before government officials learned of Garbey’s natural ability to hit a baseball and invited him to attend Escuela de Iniciación Deportiva Escolar -- Sport Initiation School -- in Havana. Garbey entered the school when he was 11 and further honed his skills -- playing baseball nearly every day -- before eventually making it to the Cuban National Series (the country’s elite league) and playing for Havana Industriales, the Cuban equivalent of the New York Yankees. Garbey played in the National Series from 1974 to 1978 and compiled solid career statistics, finishing with a .290 batting average while slugging at a .399 clip. Just 17 years old when he made his debut, Garbey totaled 78 extra-base hits -- including 19 home runs -- during his 309-game career. He led the National Series in RBIs with 40 during his final season. Twice named to the Cuban national team (1976 and 1977), Garbey won the world amateur titles as the Cubans’ designated hitter in 1976. Garbey’s name vanished from the rosters and record books for the 1979 season, however, when he was apparently implicated in a gambling scheme. He remained silent on the topic until May 22, 1983, when he revealed to the Miami Herald that he had been involved in run-shaving to keep scores close as many as seven times. Though Garbey never directly said as much, his ban from the Cuban National Series led to his decision to board that fishing boat in Mariel Harbor in early June 1980. Still, Garbey told The Sporting News in 1983, it was not easy for him to get out of Cuba. Shortly after arriving in Key West, Garbey was shipped off to one of many U.S. holding centers for Cuban refugees. His was in the Army base at Indiantown Gap, Pennsylvania, where Tigers scout Orlando Peña -- himself a Cuban and a pitcher for 14 years in the major leagues -- found him playing pepper in a pair of rolled-up blue jeans and a T-shirt and looking anything but a world-class baseball player. “A guy said, ‘That’s Garbey’ and I said, ‘Really? He doesn’t look like a ballplayer,’” Peña recalled. Peña offered the penniless refugee $2,500 to sign a contract with the Tigers and that’s exactly what he did on June 6, 1980. The only problem was that Garbey couldn’t be released from the Pennsylvania holding camp to Peña; only to a relative. Garbey’s cousin Merta, an old childhood playmate from their days in Cuba, was in New York City and had told friends in the Cuban section of Miami to keep an eye out in the paper (the Miami Herald was publishing the names of arrivals) for Garbey’s name. Merta received a copy of the paper with Barbaro’s name, recognized it, and drove to Indiantown Gap to take Barbaro to her home. Shortly after arriving in New York, Garbey received a plane ticket to Tampa from the Tigers and was assigned to Lakeland of the Single-A Florida State League, where he showed Peña how well he could hit. Garbey finished his first season of U.S. professional baseball with a .364 batting average in 88 at-bats. The next year Garbey was assigned to the Double-A Birmingham Barons of the Southern League and batted .286. His season was interrupted by a shattered cheekbone that cost him a week in the hospital. He also earned a brief July call-up to the Triple-A Evansville Triplets during which he went 1-for-12 and -- so distraught over his play -- was brought to tears following one game. After playing in just four games, he was sent back to Birmingham to finish the season. He stayed there for all of 1982 as well. “We didn’t want to risk breaking his confidence,” then-Triplets’ manager Jim Leyland said. Garbey thrived back in Birmingham in 1982, earning all-star honors while batting .298 with 32 doubles, 17 homers, and 99 RBIs -- a season, Garbey said, that started with a 0-for-16 slump but didn’t include any tears. Garbey was assigned to Triple-A Evansville for the 1983 season and had a terrific year on the field but a tumultuous one off. He finished the campaign with a .321 average and belted 14 homers in 377 at-bats. Off the field was another matter altogether, and it began with the Miami Herald story in which he admitted to taking part in the Cuban game-fixing scandal. The article, which ran on May 22, 1983, came when Garbey was hitting .308 for Evansville and after he had been placed on the Tigers’ 40-man roster before the season. The story, written by Herald writer Peter Richmond, was wide-ranging and delved not only into Garbey’s role with run-shaving, but also his continuing homesickness for his wife, Maria, and daughters, Dyjami and Dunia, and how offdays were the worst because he had nothing to do but think of the family he was forced to leave behind in Cuba. A week after the article appeared, John H. Johnson, president of the National Association, the minor leagues’ governing body -- with the blessing of baseball commissioner Bowie Kuhn -- placed Garbey on probation, which meant he could continue to play for Evansville but wouldn’t be eligible for a Detroit call-up until the incident could be more thoroughly investigated. Just a month later, Garbey’s world nearly collapsed around him. Evansville hosted Louisville on June 28, and in the ninth inning, Triplets manager Gordie MacKenzie moved Garbey from left field to third base. With a runner on second, the batter laid down a bunt and pitcher Dave Rucker sprang off the mound and sailed one high and wide of Garbey at third. The crowd groaned in disgust as the runner scored, but one fan was relentless, asking Garbey how much he was paid to drop that one, how badly his wife and children must be starving to not catch it, and whether he was trying to throw another game to get his picture into Sports Illustrated. After the game, Garbey -- carrying a fungo bat -- went to the parking lot to question the man; words were exchanged, and Garbey hit the man across the right shoulder with the bat. John Johnson acted swiftly, suspending Garbey for 30 days. “I think for a long time that as soon as I hit him, that was it, my career was ruined,” Garbey said at the time. “I would have to go back to Miami and find a job. No more baseball.” Charges by the fan against Garbey were later thrown out and Garbey was cleared of wrongdoing. Already emotionally fragile because of his homesickness, the revelation of the game-fixing scandal, and now without the escape playing baseball offered, Garbey’s life began slipping away. His sleeping and eating patterns were erratic and his behavior became a big concern -- so much so that Triplets general manager Chuck Murphy got Garbey in touch with a local psychiatrist who prescribed some medication for his sleeping and urged him to become more socially active. Garbey played well upon his return to the lineup in late July, but his probationary period due to the game-fixing wouldn’t allow for him to be recalled by the Tigers with other September call-ups. A career outfielder and designated hitter to this point, Garbey, as the Tigers desired, was working at both corner infield positions during the latter stages of the 1983 season. He also played there in the Instructional League (where he batted a league-high .347) and in the Dominican League (where he hit .333). The idea was to have him fill either position at the big-league level in 1984. Then, during the offseason, the Tigers signed free-agent corner infielder Darrell Evans and then traded John Wockenfuss and Glenn Wilson for first baseman Dave Bergman and pitcher Willie Hernandez late in spring training. Suddenly Garbey was a man without a position on a very good team. Still, Garbey had an impressive spring training in 1984 and manager Sparky Anderson -- who had three years earlier called him “the next Roberto Clemente” -- chose to bring the versatile Garbey north with the parent club. Anderson’s decision paid off as Garbey was instrumental in Detroit’s memorable 35-5 start. In fact, after 21 games (in which the Tigers were 19-2) Garbey was batting a torrid .463 with 15 RBIs in only 45 plate appearances. When Garbey made his major-league debut on Opening Day in Minnesota after being inserted as a pinch-hitter in the eighth inning for Bergman -- he grounded out to second -- he became the first Cuban-born and -trained player to debut in the majors since Tony Perez 20 years before. Garbey made his first start on April 7, when he manned first base for the first six innings of Jack Morris’s no-hitter against the White Sox. Garbey’s first big-league hit came the next day at Chicago’s Comiskey Park when he pinch-hit for Bergman and drove a Juan Agosto offering into right field for a two-run double. During his sensational first month, Garbey earned the reputation as a clutch-hitting run-producer. The first 13 times he batted with runners in scoring position, he delivered nine hits. Garbey maintained his hot start through May and was still hitting .330 on June 1. His May highlights included a four-RBI performance against the Boston Red Sox on May 1, his first big-league pinch-hit the next night, against Red Sox closer Bob Stanley, and his first big-league home run on April 25 in a 6-5 win at Cleveland. He finished the 1984 regular season with 110 games played and a .287 batting average. Of the Tigers with at least 300 at-bats, just Alan Trammell and Lou Whitaker finished with higher batting averages -- .314 and .289, respectively. Garbey also proved quite a versatile player, logging some time at first, second, and third base, as well as all three outfield positions and designated hitter. Garbey went 3-for-9 in the American League Championship Series against Kansas City. The World Series wasn’t as kind, and he went 0-for-12 against the San Diego Padres in four games as designated hitter. The following season wasn’t as great for Garbey or his teammates. The Tigers finished 84-77 and in third place in the AL East, 15 games behind first-place Toronto. Garbey appeared in 86 games and batted .257. He played sparingly in September after the late-season call-ups. He hit the last of his 11 home runs as a Tiger on September 14, off Baltimore’s Mike Flanagan, collected his final hit on September 28 against Boston, when he pinch-hit successfully for catcher Bob Melvin, and appeared in his final game as a Tiger on October 4, when he again pinch-hit for Melvin. Though a disappointing year professionally, 1985 did have a significant personal moment for Garbey. On Monday, August 19, he was married to Kimberly Grutza of Farmington, Michigan, in an 11 a.m. ceremony attended by manager Sparky Anderson, hitting coach Vada Pinson, and teammate Nelson Simmons. (Garbey has since remained mum on the family he left behind in Cuba.) The 19th was originally scheduled as an offday, but due to the brief in-season players’ strike earlier that summer, Detroit had an evening makeup game in Kansas City before heading west to Oakland. The Detroit Free Press reported that Garbey narrowly made the 3:45 p.m. team charter to Kansas City and then sat out the game, which featured the Royals’ right-handed ace Bret Saberhagen. After the season, Garbey made the demand of being played every day or being traded; and on November 13, the Tigers traded him to Oakland for speedy outfielder Dave Collins. Once in Oakland, Garbey found little opportunity to play with sluggers Dave Kingman and Dusty Baker holding down the designated-hitter spot, Bruce Bochte at first base, and a solid outfield corps of Mike Davis, Dwayne Murphy, and the young, Cuban-born Jose Canseco. Consequently, Garbey was released on March 21, 1986, just before the start of the season, and didn’t latch on with another major-league team. He spent the next season in the Mexican League, playing for the Two Laredo Owls. Garbey found trouble again during the offseason when he was arrested in the early morning of November 21, 1986, after being pulled over for speeding on Miami’s Biscayne Boulevard. As he got out of the car, he attempted to toss a folded dollar bill under his Buick sedan. North Miami police said the bill contained cocaine. Arresting officer Frank Irvine, himself a former Chicago Cubs minor leaguer, said Garbey told him: “Can you cut me a break? I’m a professional baseball player and this will ruin my career.” The officer declined and Garbey spent a few hours in the Dade County Jail before posting $5,000 bail. The charges were later dismissed when he entered a pretrial intervention program. Garbey found work in 1987 with the Campeche Pirates of the Mexican League and, hoping to rehabilitate his reputation, played for Mazatlan in the Winter League, where he batted .309 and was impressive enough to be offered a free-agent contract by the Texas Rangers; he signed December 13, 1987. Garbey began the 1987 season at Triple-A Oklahoma City and was recalled to the Rangers twice. He got into his first action with the Rangers on June 17, playing less than three weeks -- through July 5 -- before he was sent down. He was brought back and played with Texas from August 21 to season’s end. Garbey appeared in 30 games, including a dozen pinch-hitting appearances, during the 1988 season and batted just .194. He played in his final major-league game on October 2, when he pinch-hit for DH Geno Petralli and flied out to right field against the Seattle Mariners’ Bill Wilkinson. Garbey bounced around between the minors and the Mexican League each of the next six seasons. He played with Montreal’s Double-A Jacksonville team during 1989 and was signed by the Los Angeles Dodgers to a minor-league contract for 1990, but was optioned to the Mexico City Tigers before the year began. He earned a brief call-up to Triple-A Albuquerque but never made it back to the big leagues. In 1991 he played with the Mexico City Tigers, and won another championship as a Tiger -- Mexico City’s version -- in 1992. His final year of professional baseball was the 1994 season with the Yucatan Lions. Once out of baseball, Garbey found his way to Put One in the Upper Deck, an indoor batting cage in Northville, Michigan, a Detroit suburb, where he eventually became the general manager. There, he got a break that led him into the ranks of professional coaching. 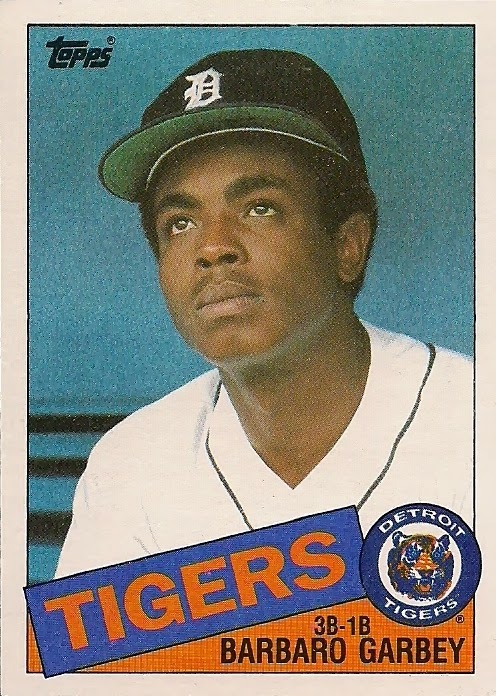 Former Tiger and Detroit native Willie Horton was bringing his grandson to Put One in the Upper Deck, liked the way Garbey worked with the hitters, and recommended him to the Tigers’ front office. In 2002 Garbey was assigned to work as hitting coach for the Oneonta Tigers, Detroit’s farm team in the short-season A-ball New York-Penn League. He spent 2003 with the low-A West Michigan Whitecaps, the Tigers’ Midwest League affiliate, before being let go by the organization after the season. Back in the Detroit area, Garbey went to work at Total Baseball, an indoor baseball academy in suburban Wixom. He latched on with the Chicago Cubs’ organization for the 2006 season, working as a hitting coach for the Single-A Peoria Chiefs (Midwest League). He spent the 2007 and 2008 seasons with the Double-A Tennessee Smokies in Kodak, north of Gatlinburg and Great Smoky Mountain National Park. He was back in Peoria for 2009. Garbey and his wife, Kimberly, settled in Livonia, a Detroit suburb, with their three children, Isabel, Barbaro Jr., and Gabriela. It originally appeared in "Detroit Tigers 1984: What A Start! What A Finish!" (SABR, 2012), edited by Mark Pattison and David Raglin. Anderson, Sparky. Bless You Boys: Diary of the Detroit Tigers’ 1984 Season (Chicago: Contemporary Books, Inc. 1984). Associated Press. “Garbey Draws Suspension for Alleged Attack on Fan,” Miami Herald, July 3, 1983: 1C. Bragg, Brian. “Kuhn Orders Game-Fixing Inquiry; Garbey Put Under Probe,” Detroit Free Press, May 26, 1983. Bragg, Brian. “Tigers Might Want to Promote Him; Union Protests Freeze on Garbey,” Detroit Free Press, June 30, 1983. Gage, Tom. “Garbey Tough Clutch Hitter,” The Sporting News, May 14, 1984: 23. George, Tommy. “Barbaro Garbey Learned to Rely on Himself,” Detroit Free Press, October 15, 1984. Guidi, Gene. “Average Hits .387: Garbey’s Swinging Sweetly,” Detroit Free Press, May 12, 1984. Kram, Mark. “Barbaro TV, Cigarets, Baseball Fill the Lonely Void for Troubled Garbey,” Detroit Free Press, August 7, 1983. LaPointe, Joe. “A Cuban With Clout,” New York Times, May 7, 1984. McGraw, Bill. “Garbey Seems a Cinch for the Tigers,” Detroit Free Press, February 22, 1984. Ortiz, Jorge L. “New Chance for Garbey: Cuban-Born Player Surfaces with Rangers,” Miami Herald, June 23, 1988: 2D. Ramos, Reinaldo. “Mariel Ex-Major Leaguer Busted,” Miami Herald, November 26, 1986: 1B. Richmond, Peter. “Barbaro Garbey Finally Takes Off His Mask,” Miami Herald, October 7, 1884. 2C. Richmond, Peter. “Cuban Star Fixed Games to Support His Family Refugee From Mariel Still May Reach Majors,” Miami Herald, May 22, 1983: 1A. Richmond, Peter. “Cuba’s Baseball Stars, Young and Old ... For Garbey, Culture, Shock, Controversy May Cease in Detroit,” Miami Herald, March 19, 1984: 1D. Richmond, Peter. “Tigers Put Hot-Hitting Garbey to Good Use,” Miami Herald, April 20, 1984: 7E. Staff reports. “Garbey Walks Down Aisle, Then Flees to Kansas City,” Detroit Free Press, August 20, 1985. Swanson, Pete. “Two Dreams Drive Triplets’ Garbey,” The Sporting News, May 23, 1983: 52. Weir, Tom. “Garbey’s Brother, Sister Enjoy Olympic Success,” USA Today, July 6, 2005. Weir, Tom. “Cuban Ballplayers Remember Garbey,” USA Today, July 6, 2005. Wilstach, Nancy. “Cuban Refugee Hurdling Barriers,” The Sporting News, July 18, 1981: 41. Hill, Doug. Telephone interview with Barbaro Garbey, July 2, 2008. Kit Krieger for Cuban National Series statistics, http://www.cubaballtours.com. Pattison, Mark. Interview with Barbaro Garbey, March 10, 2003.